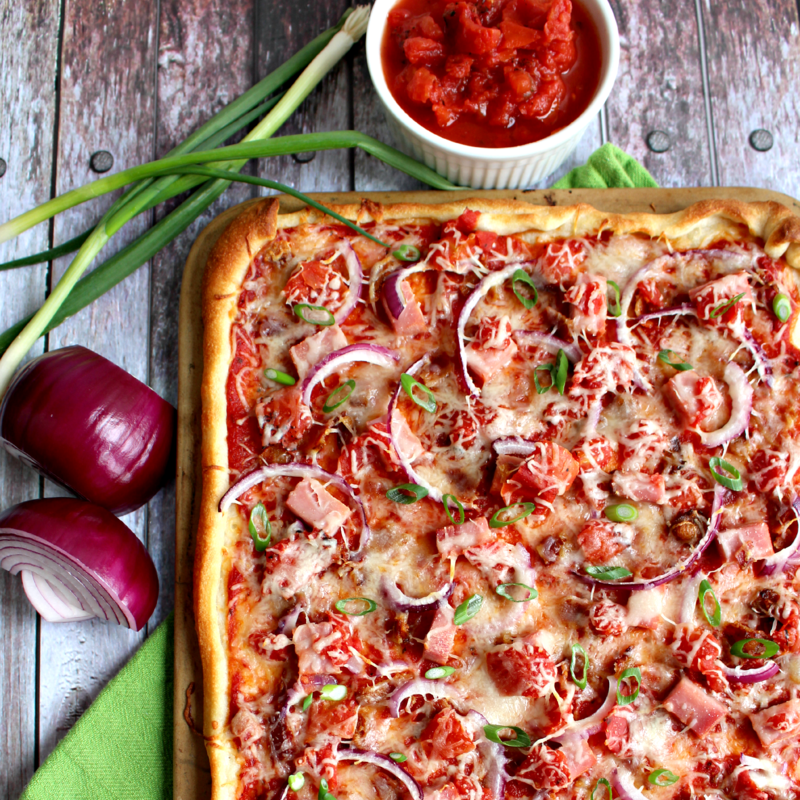 Smokey bacon, ham, red and green onions and plenty of cheese top this delicious thin crust pizza! 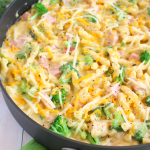 The perfect dinner option for any night of the week! Well, I don’t know about you, but we’ve had quite the winter! Multiple snow days for my son, (so many they are having to make up days on previously scheduled holidays! ), lots of snow, and some treacherous, albeit, quite beautiful icy days. Here in the mid-atlantic part of the country, when the forcast calls for snow, even just a little bit, people get a little nuts! They storm the grocery stores packing their carts full of milk, bread, toilet paper and beer, planning for the worst. Today we had another snow storm. This storm was easily the biggest of the season, and as far as snow fall is concerned, we got around 12″, which for around here is enough to shut the entire city down. It was the heavy, wet type of snow so it took my husband most of the morning to get our driveway dug out. You know its pretty bad when even he can’t make it to work! So, I have both of my boys home today. I decided it was a great day to make our own pizza!! 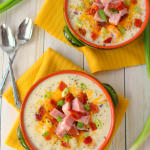 The perfect comfort food on a snow day at home. 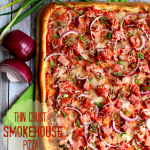 I had all the supplies to make this amazingly delicious Thin Crust Smokehouse Pizza! 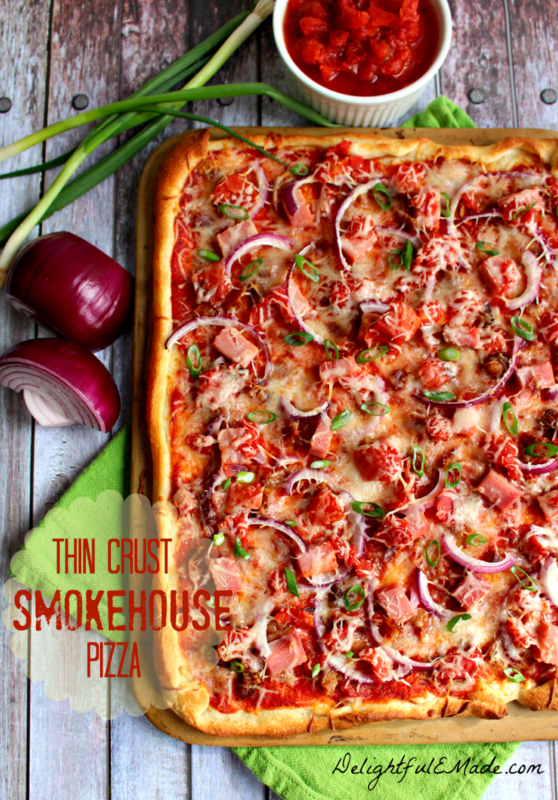 Thin Crust Smokehouse Pizza perfect for a snow day! 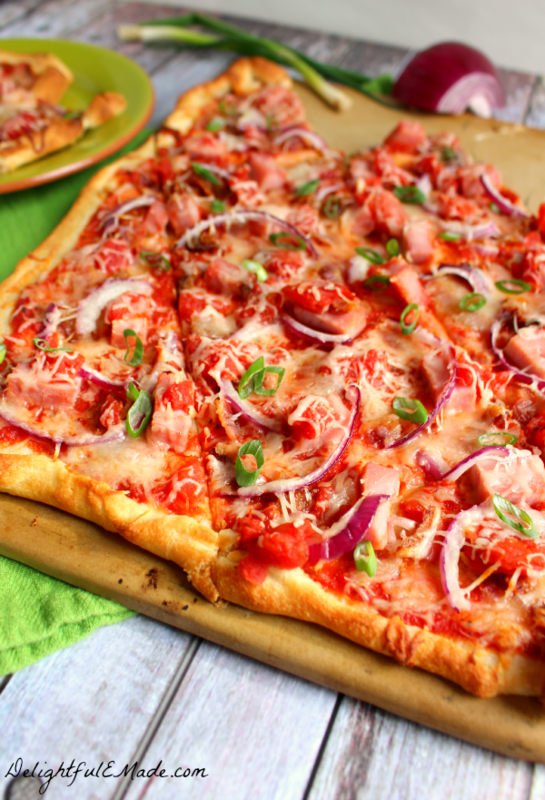 This delicious thin crust pizza is loaded with flavor and really packs a punch with fire-roasted tomatoes, onions, ham and bacon! On the pre-baked crust, spread the sauce evenly over the crust. Next add the tomatoes, ham, bacon, red onion and cheese. Bake for 10-12 minutes or until crust is golden brown. Take out of the oven and top with the sliced green onions. Slice and serve. Refrigerate any left-overs. 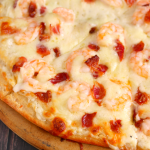 As you see from the recipe, this pizza is super easy to make. 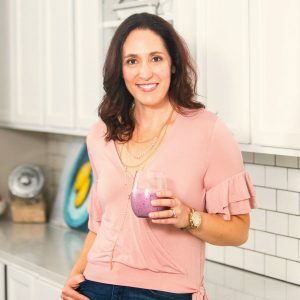 Its a great, kid friendly meal and will make everyone at your house happy to sit down for a nice meal. 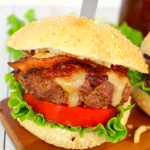 Perfect for lunch or dinner, this is great to enjoy with a nice side salad and a glass of milk! As much fun as we’ve had with our snow days this winter, I’m more than ready for spring to arrive. I’m ready to say goodbye to shoveling snow, and hello to spring flowers and warmer days. Wishing you warmer days ahead, as well! Erin, loving the pizza sauce in this.... and just the whole thing, really! Stay warm! Thanks for linking up and partying with us at Marvelous Mondays. Shared to my party board. I make pizza almost every Friday night and will be putting this one on my list! Thanks for sharing this with us at our Marvelous Monday Party! Pinning! Erin, this pizza looks fantastic! Thank you so much for joining us and sharing at Best of the Weekend - pinned to our party board. Hope you are having a happy week! This looks amazing. I'm featuring this post on the Best of the Weekend party. Hope to see you there!! Thanks for linking up!! 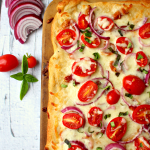 I am always on the look out for a good homemade pizza recipe and yours looks fabulous. Pinning and making this soon! Thanks for sharing your recipe. Stopping by from the Link Party Palooza. Erin, This looks incredible. Pinned. Found this on Link Party Palooza, and I will for sure be back. 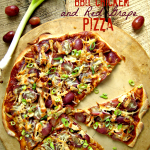 I love homemade pizza, and I am always looking for new sauces and crusts. This looks like a winner! Gorgeous pics too!